There are fewer than 90 calendar days for you to complete the annual ethics requirement mandated for the Defense Acquisition Workforce. 1. Take one of the two online courses available through the iCatalog. The available courses are CLM 003 (Overview of Acquisition Ethics) and HBS 415 (Ethics at Work). Important note: You can get credit for CLM 003 only once in a two-year CLP CLP cycle; the new cycle began Oct. 1, 2016. 2. Take the course in person when your command or garrison offers it locally. Contact your training coordinator or your ethics officer if you are unsure when local training will be offered. Once your annual ethics training is complete, you must list the course as completed on your Individual Development Plan (IDP) within the Civilian Acquisition Personnel and Position Management System (CAPPMIS) and obtain supervisor concurrence. NOTE: Army Acquisition Workforce (AAW) members who use TEDS must follow the Ethics Training Implementation Guidelines to determine how to list your training properly to ensure that it flows into the CAPPMIS IDP. The Army DACM Office is responsible for tracking and reporting compliance to the undersecretary of defense for acquisition, technology and logistics. Your command representatives—acquisition career management advocates and acquisition points of contact—are responsible for ensuring command and program executive office compliance. As an acquisition professional, you are responsible for meeting this requirement. Phase II of the Army DACM Senior Rater Potential Evaluation (SRPE) mandate goes into effect Nov. 1, affecting all GS-13s and GS-14s and their broadband equivalents. The SRPE evaluation period should address potential demonstrated from Oct. 1, 2015, through Sep. 30, 2016, and senior leaders have until Jan. 31, 2017, to complete this requirement. SRPE is not to be confused with your annual performance evaluation. It is used to evaluate the potential of civilian employees in designated grades to perform in positions of increased responsibility, whereas the Total Army Personnel Evaluation System and the various personnel demonstration projects evaluate the quality of performance associated with current duties and contributions to the mission. Those affected by the SRPE policy will receive an email Nov. 1 with a link to the SRPE portal in CAPPMIS, which can be used to facilitate compliance with the mandate. The policy advises that within 90 days, all raters and senior raters will be required to initiate and complete SRPEs on all identified AAW members. For additional guidance regarding the SRPE and this upcoming exercise, please contact Ms. Kelly Terry at kelly.l.terry2.civ@mail.mil. 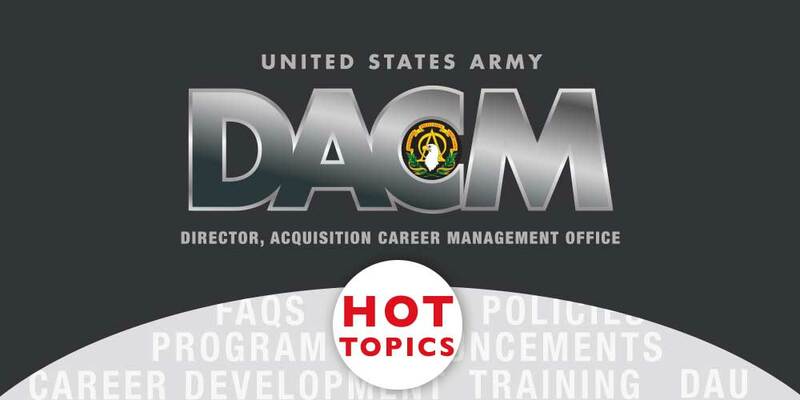 The application window opened in August for FY18 Army Acquisition Centralized Selection List positions for lieutenant colonels/GS-14 and colonels/GS-15. Go to the program page for more information. The application window is also open for the FY17 Army Acquisition Civilian Centralized Selection Boards for product directors (GS-14) and project directors (GS-15). The product director application window closes Nov. 10 and the project director window closes on Nov. 21. 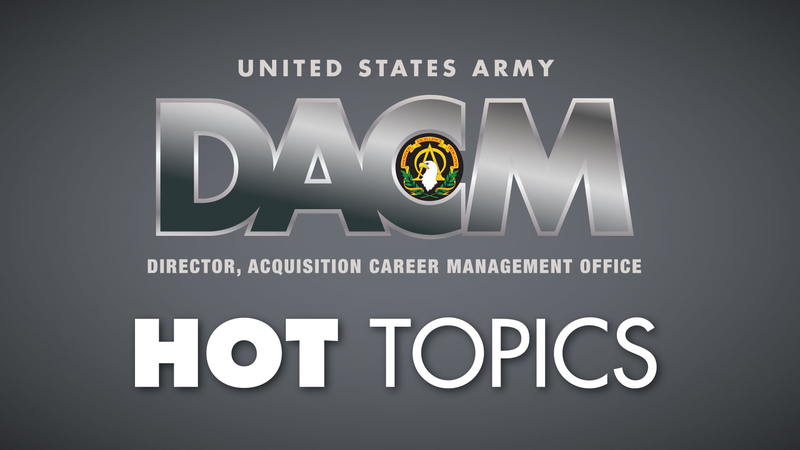 Go to https://asc.army.mil/web/career-development/prod-dir/ for more information. The Army Acquisition Training with Industry Program application announcement is open and will close on Nov 3. FY17 New Course and Names Changes: To view details of new courses and valid dates of the predecessor courses, please see the DAU iCatalog. The Acquisition Leadership Challenge Program nomination window opens Nov. 3 for FY17 second quarter classes. Learn more about the program and how to be nominated at https://asc.army.mil/web/career-development/programs/acquisition-leadership-challenge-program/.